Before dismissing this new Christmas family Netflix original as boring fare, one should give the film directed by the director of the ANGRY BIRDS animated feature a chance. THE CHRISTMAS CHRONICLES is actually surprisingly watchable though it rehashes many of producer Chris Columbus earlier films like HOME ALONE, GREMLINS and ADVENTURES IN BABYSITTING. Kate (Darby Camp) is a 10-year old who still believes in Santa. Her brother, Teddy (Judah Lewis) is having doubts. When they decide to cam-record Santa on Christmas eve, trouble begins when they sneak a ride on his sleigh resulting in lost toys and Santa arrested. It is up to the two to save Christmas. The story is cliché ridden. The premise is that Christmas needs to be saved. The audience is led to believe that without the presents, good cheer will be lost resulting in unhappy angry people with lots more crime in the streets. The script contains original ideas. As the three search for the missing reindeer, they meet strangers – all of whom Santa knows (whether good or bad) since he had delivered presents to everyone when they were children in the past. This idea provides ample opportunity for jokes and comedic set-ups. For a silly movie based on a silly premise, THE CHRISTMAS CHRONICLES is quite endearing and funny, making it light and enjoyable entertainment for the undemanding moviegoer. Take the scene where the two ids first meet Santa Clause (played amicably by Kurt Russell). “Alive and In Person one night only!” He jokes. “Disappointed. Yes, I am not what you expected? I get fat after all the cookies I eat.” hen asked to go; “Ho-Ho-Ho.” His reply: “I don’t do that. That is a myth. Fake News!” The notion is the that the filmmakers know wheat this film is, never aim that high and take it for what it is. This little film has more laughs than the dismal recent DR. SEUSS’ THE GRINCH based on the Christmas classic that audiences expect much more from. The main character is Kate played by a young Darby Camp. Camp is sufficiently endearing and cute, delivering her one-liners like a pro. When Santa loses his magic hat, he questions Kate: “How do you think I am able to leap from one rooftop to another? “Pilates?” replies Kate who decides then to help Santa so that she can remove herself from his naughty list for life. Her brother Teddy plays second fiddle to her. The film also contains an animated segment featuring the elves in Santa’s workshop and a musical number performed in a jail cell. What is a Christmas film without a Christmas message? 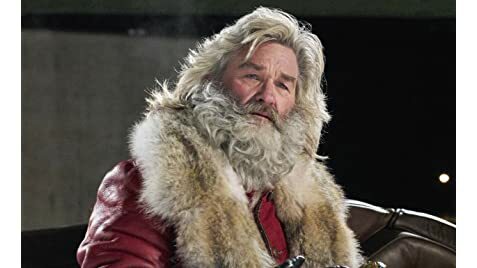 The corny message delivered by Kurt Russell’s Santa feels at least, sincere. The best thing about this film is actually Santa i.e. Kurt Russell. 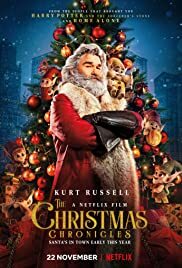 Whether crooning the song “Santa is Back in Town” in shades or trying to convince everyone that he is the real thing, this is Russell’s movie.